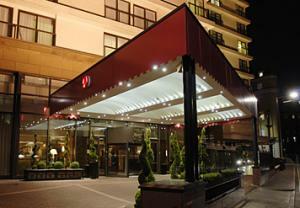 A central location, superior amenities and friendly service attract savvy travellers to the London Marriott Hotel Marble Arch. Within walking distance to Hyde Park, Oxford Street, West End Theatres and some of the city’s finest restaurants, this boutique hotel in London is also near the financial district, department stores, families attractions and museums. The London Marriott Hotel Marble Arch welcomes you into its casually elegant setting, where spacious guest rooms are perfectly appointed for a comfortable and productive stay, offering a cosy sitting area, work desk and high speed internet access Wi-Fi in all the bedrooms. Work out at the health and leisure club, and indoor swimming pool; unwind in Chats Cafe Bar over afternoon tea and drinks, or indulge in freshly prepared dishes at the Brasserie Centrale. Business and social events are beautifully accommodated in the 264 square meter conference and meeting facilities, the outstanding catering and skilled planners are to ensure a successful outcome.